This workshop is a game changer. For those who immerse themselves in the process it can yield career- changing results. Bob Kegan and Lisa Lahey the creators of the process have this to say about it. 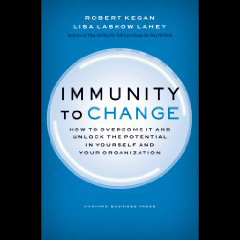 "The Immunity-to-Change™ approach is specifically designed to help individuals, work teams, and organizations make those personal and collective changes that are most important to them-- but have proven resistant even to thoughtful plans and heartfelt intentions. The approach first generates a customized picture of something which is usually invisible—the way our current mindset produces exactly those behaviors which prevent progress on the goal we most want to achieve. This is the immunity to change. Once we see the real source of what has been preventing change, the approach guides us on a new path to accomplishing it." -- Bob Kegan & Lisa Lahey (world renown thought leaders in adult development). Spend a day with our trained faciliators to uncover your hidden Immunity-to-Change™. The workshop is designed to improve your skills in having hard conversations at work. Having hard conversations at work is one of those issues that separate great organizational leaders from mediocre ones. This workshop can teach you how to have conversations that will lead to the root of the issue quickly -- making you more effective in your work setting. Leaders who know how to facilitate effective communication when faced with a conflict can redirect an argument towards dealing with the issue. They are people who lead others around them from being ordinary opponents to extraordinary teammates.